I’ve seen many real estate investors get really creative when it comes to investing over the last few years. One of the creative strategies that a lot of investors have been contemplating is whether or not to use Airbnb for their investment property. In case you haven’t already heard of Airbnb, think of it as an online accommodation matchmaker of sorts like Tinder; or if that’s not in your wheelhouse, think of it like Uber for short-term rentals. Uber matches drivers to passengers via an app, while Airbnb matches tenants to landlords using their app or website. Here is little background information to date. Airbnb, like Uber, has come under many scrutinies in the past few years as this platform is pushing the boundaries of very old fashion rules. The major disagreement comes from the city, condo owners and the hotel industry as to whether they will ultimately allow for this “disruptive technology” to continue its operation in the city. The City of Toronto views Airbnb as a way for Airbnb’s users to break the short-term rental regulations in place. Technically, any rental for less than 28 consecutive days is not permitted. In addition, the CRA doesn’t always get tax revenue from Airbnb rentals either (if they are not reported by the property owner). Condo Owners despise Airbnb because it allows strangers to frequency go in and out of the building, which increases the potential for damages and noise level. The Hotel industry, as you could imagine, is not too fond of Airbnb as the Airbnb rates are often less than hotel rates. The hotel industry is quite powerful in Toronto and has been lobbying against Airbnb for quite some time now. 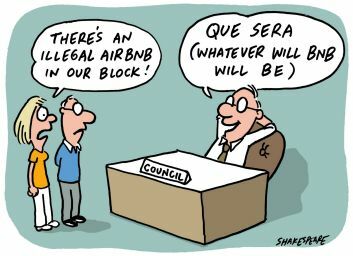 Today, the city and council members on voting on a new regulation for Airbnb. It’s going to be big. I’ll keep you posted on the outcomes next week. Before I answer the question, I’ll provide you with an annual rental rate difference using a 1-bedroom downtown condo for example. In the course of 1 year, a standard 500 square foot 1-bedroom condo could yield you $2,000 per month of rent or $24,000 in rental income per year. Using Airbnb, with the same unit has been rented for upwards of $6,000 per month during the summer (high season), but obviously with more vacancy during the winter season. On average, the annual rental income is about $35,000 – $50,000 depending on how well you manage your unit. Obviously to the investor, that is a pretty big gap in terms of rental incomes and is also why the idea of using Airbnb is rather appealing. Whether you should be listing your investment property on Airbnb depends on how you answer the following questions. 1) Does your condo allow for Airbnb short-term rental? If your condo DOES NOT allow for Airbnb, I would scrap all ideas for this strategy. Each condo has their own by-laws, and depending on who sits on the condo’s Board, there is a very good chance that your condo may not even allow for Airbnb. Understand that if you violate the by-laws, the Board has the right to ask you to vacate and/or sell your condo. 2) Are you willing to take time out of your day/weekend to meet your potential tenants for key exchange? Some condos that allow for Airbnb will have a concierge that can do this exchange for you. However, that is really rare in Toronto. If that service doesn’t exist in your building, are you willing to take on this extra responsibility for the rental income? Some of my clients who live downtown themselves are willing to do so. Some of my clients who do not live downtown get turned away from the idea of Airbnb because of this. 3) Are you able to finance the property if Airbnb gets banned? This question is important because if you have been analyzing your investment and making the investment work strictly with Airbnb numbers, then you must understand that there is a good chance that the City could ban this Airbnb strategy. If that becomes the case, then you may need to revert the property to a standard rental unit. If you answered, YES to ALL of the questions above, then I would say go ahead and use Airbnb for your condo. It will definitely yield you a higher rental income. Make sure you stay tuned for next week’s Insight Article as I will be providing you with my tips on how to maximize cash flow using Airbnb. If you answered NO to ANY one one of the 3 questions above, then I would recommend for you pass on this strategy. It would be best for you to not have to jeopardize your investment property.